Tablet Coating Machine. It's a kind of equipment integrating elegance, high efficiency ,safety, easy to clean, which is applied for coating traditional Chinese and western tablets and pills, including the micro pills and granulated pills, small pills, water pills, drip and granulated pills, with sugar, organic film, water soluble, film , slow and programmable PLC ( machine and person interface),with which its operation process and process parameters such as negative pressure and temperature can be automatically controlled It's easy to operate, with reasonable and advanced process during run of the machine. 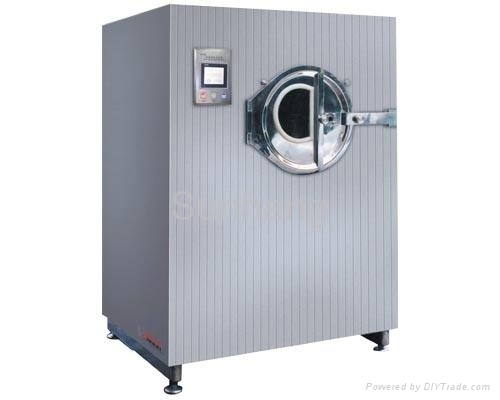 Main machine, cleaning system, hot air cabinet, exhaust cabinet and the thermostatic mixing drum are all made of imported high quality, stainless Steel, which conforms to GMP requirements. This product has passed the certification of CE. The tablets make complicated and constant track movement with easy and smooth turning and frequent exchanging in a clean and closed drum of the film coating machine. The coating mediums stirred in the constant temperature stirring drum are sprayed on tablets through the spray gun at the inlet under the action of crawler pump. Meanwhile hot air up to 100,000 level filtration are inhaled through the air distributing pipe at the center of the drum and flowed through tablets around the fan blade. Under the action of air exhaust and negative pressure, hot air are exhausted from the another side of the air distributing pipe and discharged after dust abatement. So these coating mediums on the surface of tablets get dry quickly, forming a coat of firm, fine and smooth film. Automatically controlled by PLC, it is in normal operation. 1、The drum of the main machine has a closed poreless structure and is equipped with a flow-guiding sheet. Tablets can make easy and smooth rotation without fragment and chipped edge in the drum due to mirror polishing of its wall and flow-guiding sheet, which greatly improves the yield. The pored machine has a wide application, energy and auxiliary saving and easier to clean. 2、 During air intake, three times filtration involving primary filtration, medium filtration and high filtration, can reach 100,000 level purification. During air exhaust, dust abatement can reach 99% by adopting a bag-type dust extractor. 3、 A specially designed air source exchange system features exchange of hot air an cold air depending on the technological requirements, so to say, the fan blade can be regarded as air inlet or air outlet. The vane bore can meet the user's requirement from 0.6 to 3.00 mm, which can be suitable for different specifications coat. 4、 An eye pitch explosion-proof lamp is equipped in the drum so as to clearly view all material in run for the convenience of accurate of accurate control of technological change. Other station the same as BG-E Series High-efficiency Intelligent Film Coating Machine.